“Bring it. Bring the pain!” So proclaims Katie at the beginning of the Back & Biceps routine. And what a routine it is. My feeble mind, in its attempt to support my P90X effort, casts away any bad memories of painful workouts soon after each routine ends. So prior to starting the DVD, I reviewed my worksheet and saw a good trend of ever increasing weights and lower reps, consistent with my goal to build mass. What I failed to take into account is the considerable effort and, yes, pain associated with some of the weight increases. Take, for instance, the Open Arm Curls which make their appearance about half way through the routine. At this point, my biceps are pretty much reduced to being a twitching mass of tissue with little left in the tank. When this particular exercise was introduced in week 5, I did 12 reps at 15 lbs. In week 6, reps reduced to 8 at 20 lbs. Week 7 progressed to 9 reps at 22.5 lbs. Yesterday? Hey Albert, why not try 30 lbs? Well, my right arm could, but my left arm didn’t even move up an inch. I lowered the weight and grunted out 8 reps at 25 lbs. So that’s the theory: reduce the reps, increase the weight, gain mass. I made a note for week 12 to attempt this exercise with 50 lb weights and zero reps… I plan to just stare the weight down and visualize increased mass. Overall, I was actually successful at increasing weight throughout the routine. And I managed at least one unassisted pull up of each type. I know I gave the routine a good effort because I’m feeling pretty wiped out this morning. Ab Ripper X. Did that as well. I tried some of the bicycles with the arms up. Guess what? It hurts more. 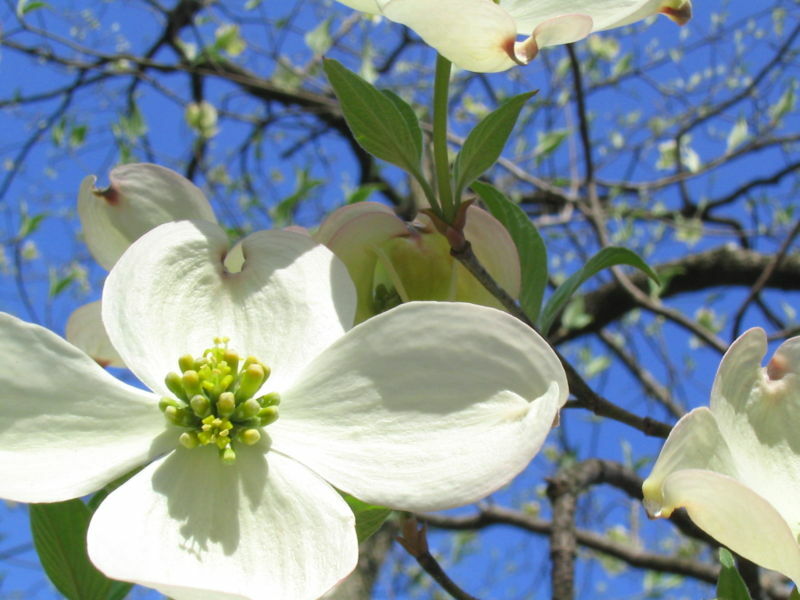 Spring has arrived in Atlanta, and the dogwoods are just beautiful, but the pollen is in the air and in my lungs. Earlier in the week I was having a bit of trouble catching a full breath of air. Claritin has helped. This entry was posted in P90X, Round 1 and tagged Ab Ripper X, Back & Biceps, Katie, P90X, Pain, Pull Ups. Bookmark the permalink. Hey man, been following your blog for a while as you’re about a week ahead of me – on day 59 today.It’s good to get a heads up on what I’ve got to face in the next week. I still have trouble with pullups – we tall fellas just aren’t built for them I swear. Especially those ones nearer the end of a workout when I ‘m just hanging there willing myself upwards, get nowhere and then reach for the stool. Still, the results are great regardless. Keep up the good work and keep bringing it!